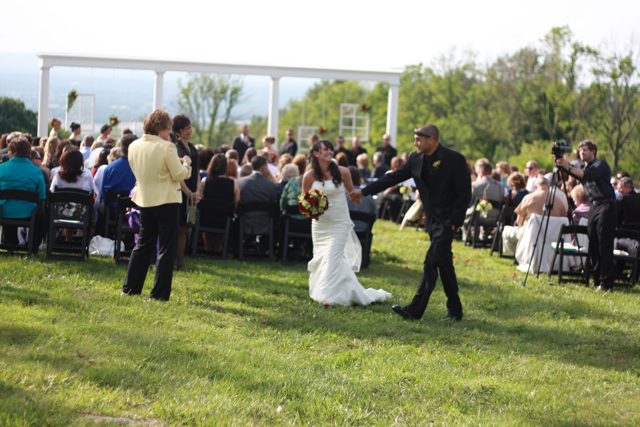 Brittany married this past weekend on her family farm. 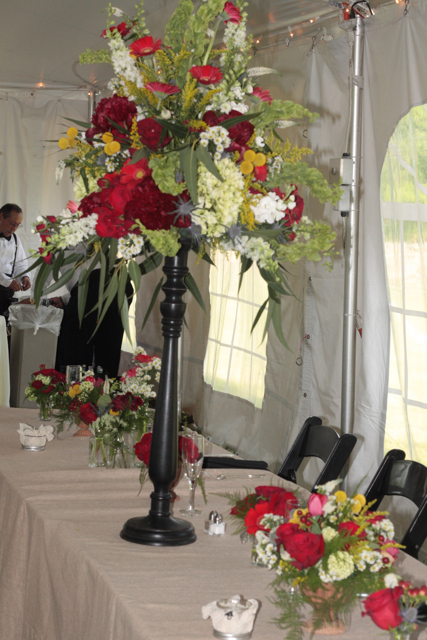 We provided the flowers, the event design, and we planned the wedding. 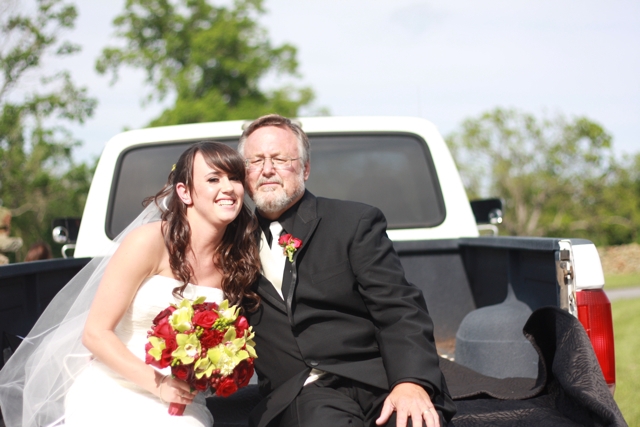 Britt is a true farm girl and she loves her truck so she chose to arrive at the ceremony on the back of her pick up truck. Perfect!!!! 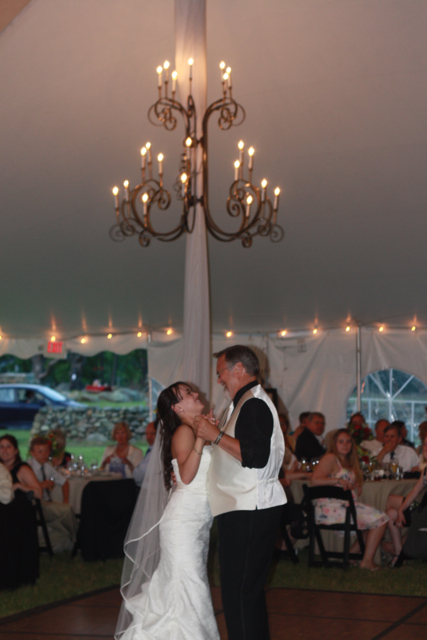 Britt’s father designed and built this amazing ceremony site for the wedding. 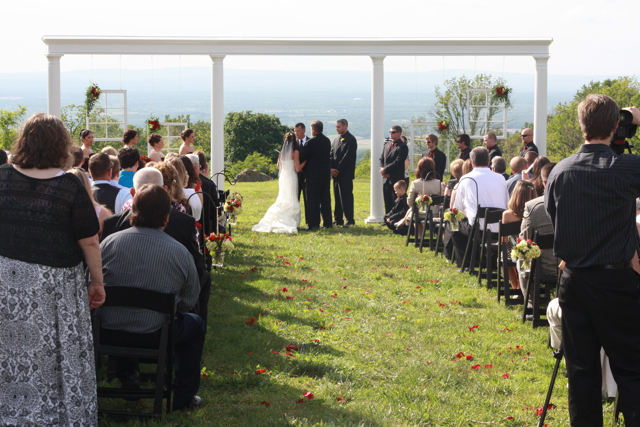 The view was breathtaking. 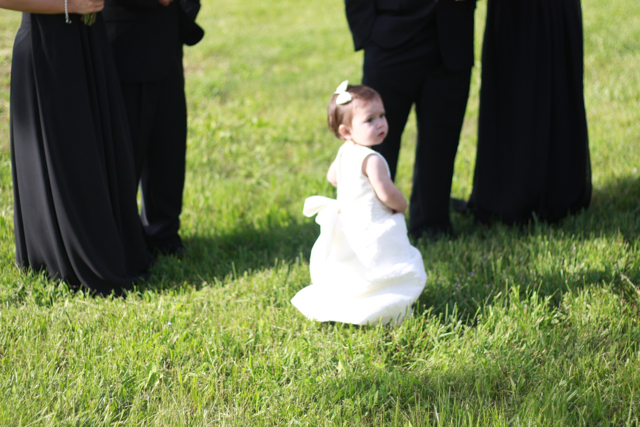 The children of the family all had a part in the wedding, even this sweet baby girl. 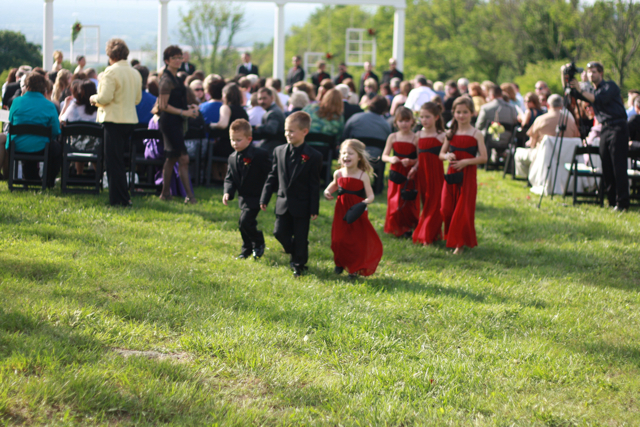 Because the property was so large we had a huge field for the ceremony, a separate field for the reception area, and our cocktail hour was stationed along an old stone wall. 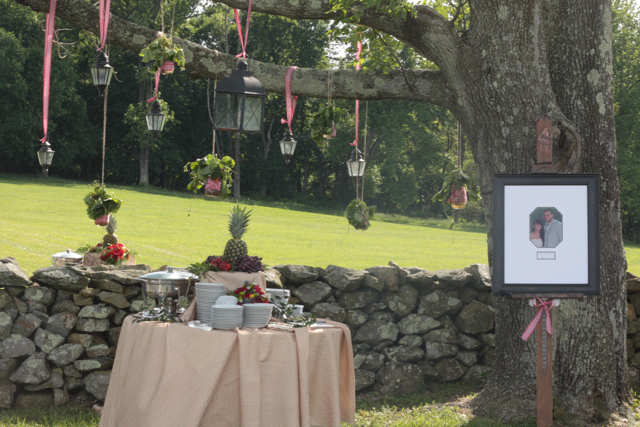 An underlying theme behind the day was strawberries. 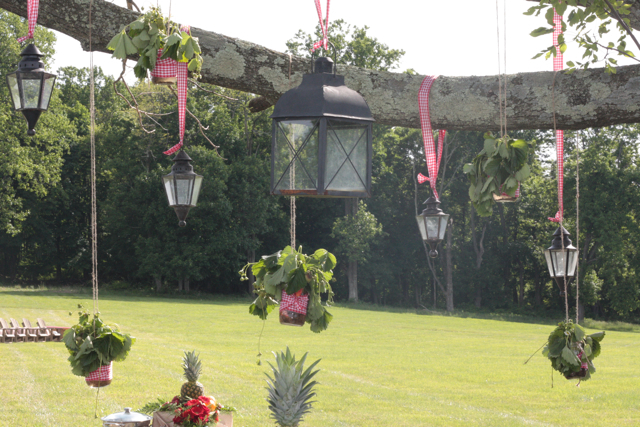 I dug up several of my fathers strawberry plants and these were hung over the limb of a huge tree to help decorate the cocktail area. 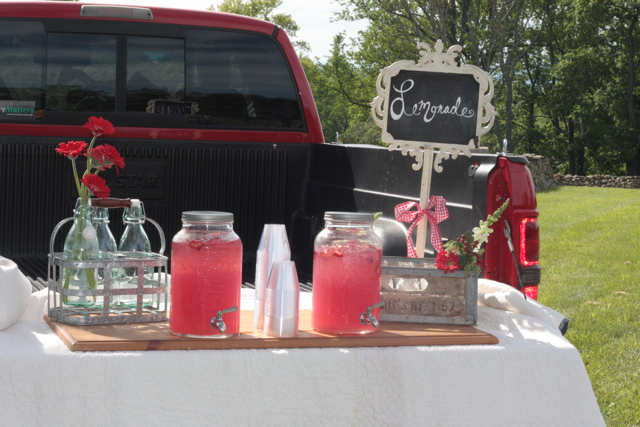 This area also featured a fabulous strawberry lemonade stand, old shutters to hold the place cards, and a fun quilted space for the gifts. 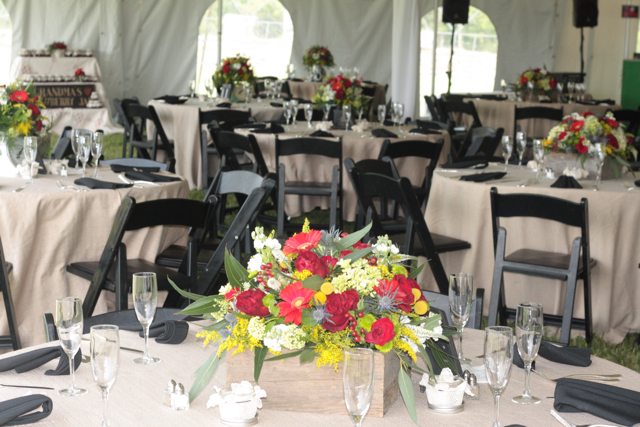 The family played a huge part in the styling of this wedding, our bride knew she wanted black chairs and black napkins. 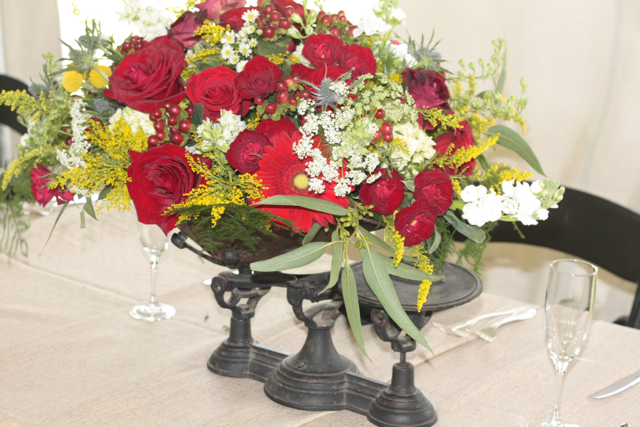 The mother of the bride loved our vintage scales so we began with those concepts and built everything else from there. 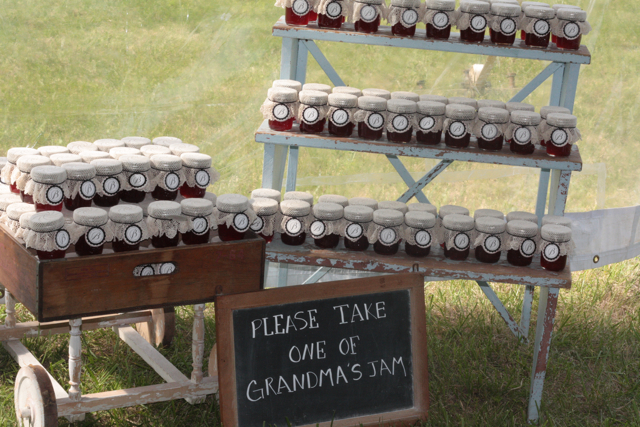 We pulled antiques and vintage inventory from our studio and we were also allowed to pull some great props from the family. 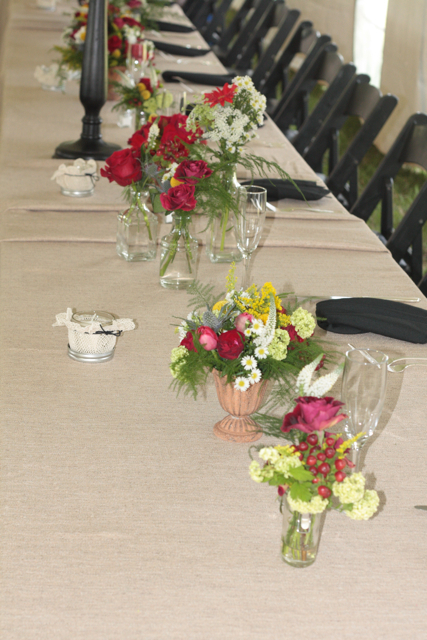 The head table featured elevated arrangements on black candlesticks, old scales, and lots of sweet little designs in glass bottles or tin urns. 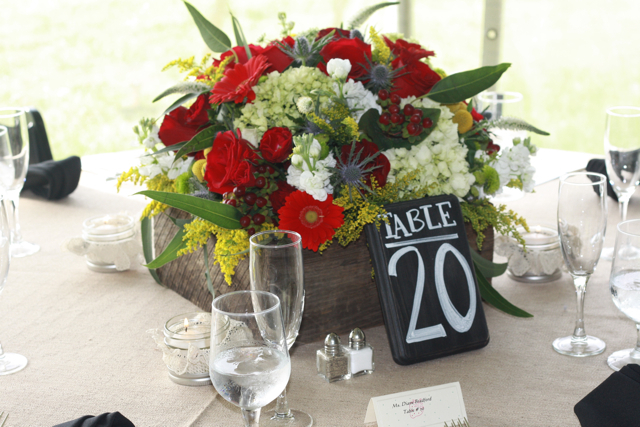 Our barn board boxes were used for half of the tables. 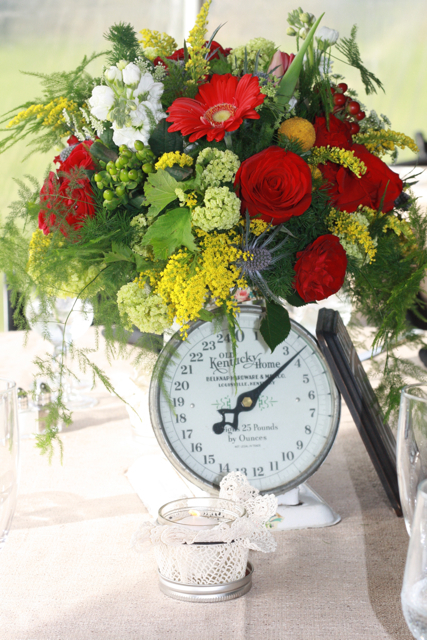 The scales were used on the rest of the centerpieces. 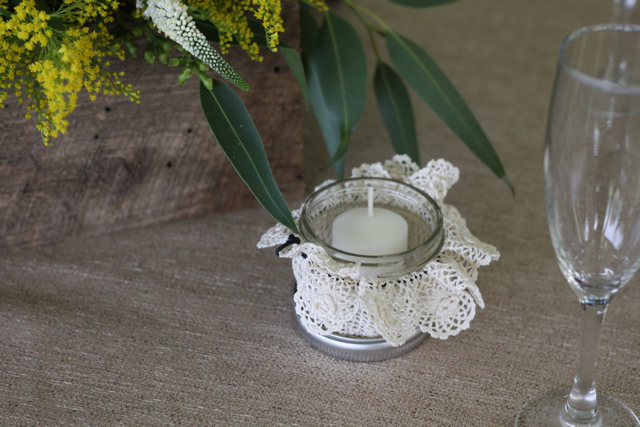 I was crazy in love with these doilies the family found for grandmas jam, so we suggested these be used on jam jars to create votives. 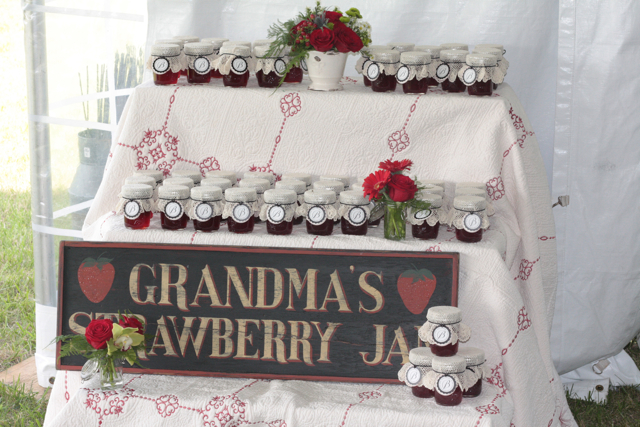 Grandma made strawberry jam for all of the guests and the family had this adorable sign made for grandma’s kitchen which was given to grandma after the wedding. 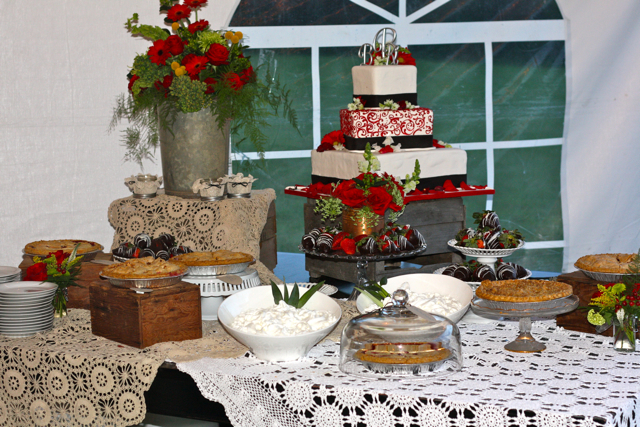 Large arrangements were created for the buffets, bars, and dessert stations. 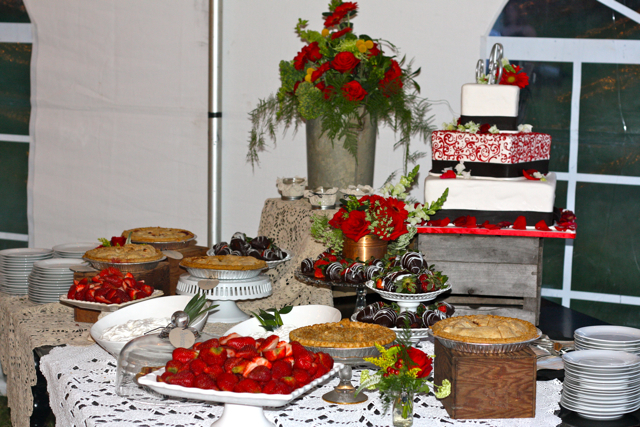 We also laid out this wonderful dessert table that featured chocolate covered strawberries, strawberries and whipped cream, strawberry pies from my daddies store in Lucketts, Heiders Country Store, and of course wedding cake. 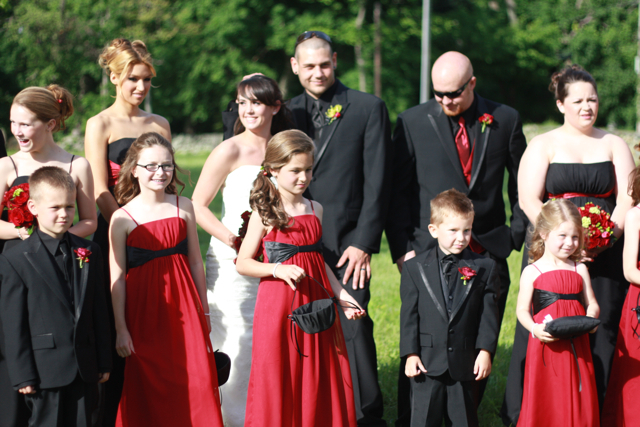 From dinner to dancing, we managed this whole night and we are totally proud of this “Holly Styled Wedding”. 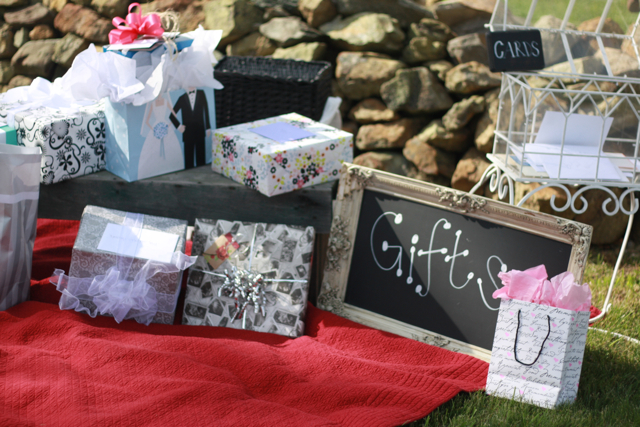 What amazing details! Great job, Holly! 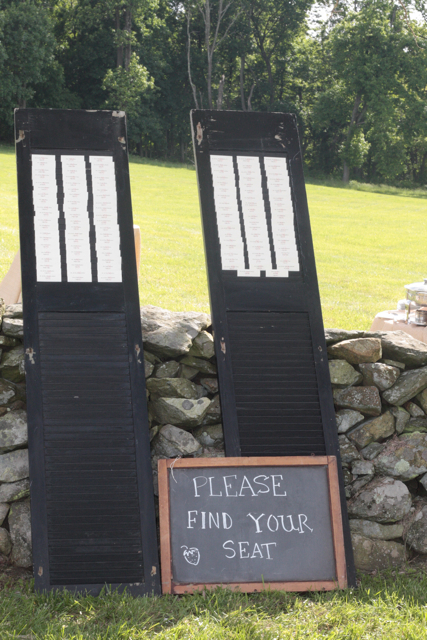 I just bought 2 black shutters at the Lucketts Spring Market, plan on using them the same way! Great minds ehh! 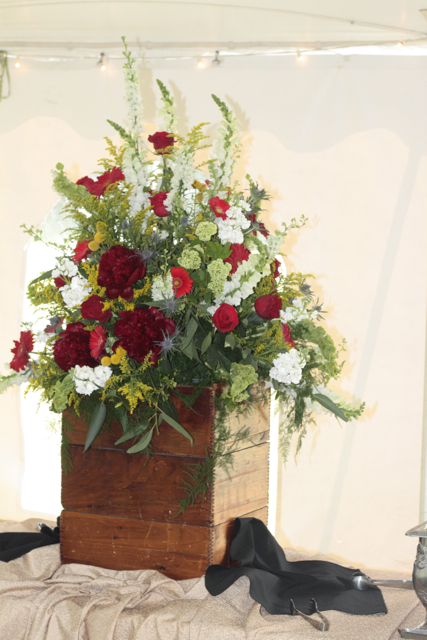 Beautiful arrangements as usual!